Posters of Mustafa Kemal Ataturk (L) founder of modern Turkey, and current President Recep Tayyip Erdogan are displayed at the Spice Bazaar plaza, during the re-opening ceremony following its restoration in Istanbul, May 4, 2018. Turkey's opposition parties have selected their candidates to challenge President Recep Tayyip Erdogan in next month's snap election. 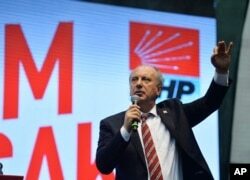 The main opposition CHP picked veteran deputy chairman Muharrem Ince, a fiery critic of Erdogan. Addressing party supporters in Ankara, Ince removed his party badge, replacing it with one of a Turkish flag. "I will be the president of 80 million, of rightists and leftists, of Alevis [an Islamic sect] and Sunnis, of Turks and Kurds," he said. "I will be an impartial president." Muharrem Ince, a lawmaker with Turkey's main opposition Republican People's Party, CHP, delivers a speech at his party congress where he was announced as a presidential candidate, in Ankara, Turkey, May 4, 2018. The 54-year-old former physics teacher is seen as a shrewd choice by CHP leader Kemal Kilicdaroglu. Ince has built a reputation of having a common touch. He is also social media savvy, being only second to Erdogan in Twitter followers. The announcement of his candidacy saw #İNCEdenDemokrasiGelecek (Democracy will come with İnce) becoming the second global trending topic, after #StarWarsDay. In a sign of what possibly lies ahead, Erdogan supporters were quick to distribute across social media a photograph of Ince drinking a beer with his family, allegedly during the Islamic Holy fasting month of Ramadan. Unbeaten in 15 years of elections, Erdogan, a devout Muslim, routinely portrays Ince's pro-secular CHP as anti-religious. Turkey is an overwhelmingly conservative country, and the presidential elections will take place during Ramadan. But in a move to reach conservative voters, Ince pledged to hold meetings every night at 1:30 a.m. to coincide with the time that fasters rise to eat before sunrise. Political observers claim if Ince is to have any chance of success, he will need to make inroads into Erdogan's normally loyal conservative religious base. Muharrem Ince, Turkey's main opposition Republican People's Party (CHP) candidate for the upcoming snap presidential election, attends friday prayers in Ankara, Turkey, May 4, 2018. Critics claim the CHP should have chosen a nonpartisan, conservative candidate. "With a presidential candidate that has zero appeal outside its own 25-percent usual voter base, Turkey's main opposition CHP has shown once again that it has no vision to win elections," tweeted Mustafa Akyol, a conservative writer on Turkish politics. But the CHP has taken steps to reach out to religious voters. In a groundbreaking move ahead of parliamentary elections due to be held simultaneously with presidential polls, the CHP formed an electoral pact with the Islamist Sa'adet Party as part of a four-way party alliance. FILE - Turkey's President Recep Tayyip Erdogan, right, shakes hands with Temel Karamollaoglu, the leader of pro-Islamic Felicity Party, before their talks in Ankara, Turkey, Feb. 9, 2018. Sa'adet's leader, Temel Karamollaoglu, has also declared himself a presidential candidate. With Sa'adet outside parliament, Karamollaoglu needs to secure 100,000 nominations. In a goodwill gesture, the CHP leader, Kilicdaroglu, has called on his members to support Karamollaoglu's nomination. Securing Karamollaoglu's backing in a presidential runoff is seen as offering Ince his best chance of luring away conservative voters from Erdogan. 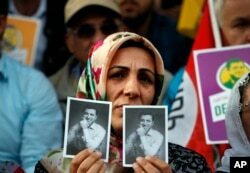 Supporters of the pro-Kurdish Peoples' Democratic Party (HDP) some holding pictures of the party's former co-leader Selahattin Demirtas, currently in prison on charges of leading a terror organisation, chant slogans during a rally announcing him as a presidential candidate in Istanbul, May 4, 2018. 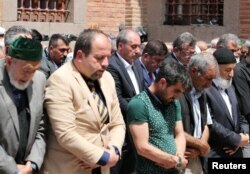 But the potential kingmaker is Turkey's Kurdish voter base, which accounts for around 20 percent of the electorate. Friday the pro-Kurdish HDP, Turkey's second-largest opposition party, announced its imprisoned former leader Selahattin Demirtas as its candidate. The declaration was made in simultaneous events in Istanbul and Diyarbakir, the main city in Turkey's predominately Kurdish southeast. 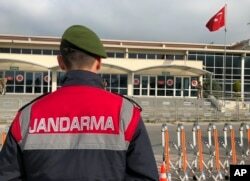 Turkish soldiers stand outside the court in a prison complex where the trial against former pro-Kurdish party co-chairman Selahattin Demirtas and legislator Sirri Sureyya Onder continues, in Silivri, outside Istanbul, April 30, 2018. "The dignified stance of millions whose hearts beat with mine against all pressure has proven that a [prison] cell that can fit 6 million people has not been built yet. I have tried to represent the values of freedom, democracy, equality, and justice here in your name," Demirtas declared in a statement read by HDP leader Pervin Buldan to supporters in Diyarbakir. Demirtas is facing more than 100 years in jail on terrorism charges under Turkey's emergency rule, introduced after the failed 2016 coup. Even though he is in jail, he can still run in presidential elections under the election laws — until convicted. Demirtas has a court hearing on June 8, when prosecutors are expected to press for a verdict. Analysts say because other opposition parties have excluded the HDP from an electoral alliance in parliamentary elections, the exclusion of Demirtas from the presidential elections could lead to calls for a boycott by HDP voters. "Kurds and Kurdish HDP are openly excluded from the [electoral] alliance," political scientist Cengiz Aktar said. "By doing so, frankly, the opposition actually tells everybody their stance towards the Kurds is little different from the AKP." The CHP voted in favor of lifting Demirtas's parliamentary immunity, opening the door to his prosecution and jailing. But Ince was among a number of dissident deputies that voted against the move — a stance praised among HDP supporters. With the HDP having around 10 percent of the vote, their support, analysts say, is vital for any candidate seeking to defeat Erdogan, who remains the clear front-runner. But observers say with the opposition parties all fielding strong candidates, Erdogan for the first time, faces challenges from across the political spectrum. "Erdogan is facing the prospect of a complex electoral map, something he has not faced before. It will be more challenging," said political analyst Atilla Yesilada, of Global Source Partners.